those challenge events and the whole world..
FENOMENALE IL TOUR 2018, after the German tranche starting March 10th from Frankfurt, will see the rocker protagonist on the stages of the most important Italian sports Palazzetti from March 29th . 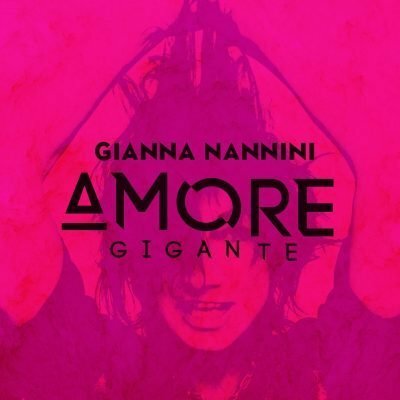 29 January Amore Gigante is certified Gold Disc, and on 9th february Gianna participates as very special guest in the 68th Sanremo Festival, hosted by Claudio Baglion. On September 15, 2017, the new single “Fenomenale” is released, anticipating the new album “AMORE GIGANTE” coming out on October 27th. On June 24, Gianna participates in Vienna’s Wiener Doanuinselfest 2017 live broadcast on ORF1 and is organized in memory of the great Falco singer-songwriter, she was the only international guest. In the meantime, the new album “AMORE GIGANTE” is scheduled for October 27 with three exceptional concerts Gianna in Rome (December 2 – Palalottomatica), Milan (December 4 – Mediolanum Forum) and Florence ( December 6 – Nelson Mandela Forum). Hitstory European Tour, the European tour of Gianna Nannini, launched on 25 March from Lausanne with incredible public success, continues its unstoppable triumph and collects a sold out after another, ending on July 29 with a sold out at the Kapfenburg Castle. On 7 October 2017 Gianna participates in the program for Nena’s 40-year career where she presents an “unpublished” Italian version of “Liebe ist”: Liberi amo. CINEMA is the new single from “Amore Gigante”from 8 december 2017. In March she start her “HITSTORY TOUR” in the most prestigious theatres of Italy. During 3 hours of show of Hitstory Tour, Gianna Nannini retraces her successful career with her hits. On May 14th she celebrate her first part of tour in Arena di Verona, accompanied by the Bohemian Symphony Orchestra of Prague directed by Wil Malone. The 15.000 spectators remain seated under the incessant rain, hearing and watching her show for more than 3 hours. On December 2, 2016, HITSTORY TOUR EDITION will be released CONTAIN THE TWO HITSTORY + DVD LIVE CD WITH EXCLUSIVE CONTENT + BONUS TRACK LIVE MAMA AND LATIN LOVER WITH THE BOHEMIAN SYMPHONY PRAGUE ORCHESTRA. On 14th February Gianna participates as very special guest in the 65th Sanremo Festival, hosted by Carlo Conti. Before the Italian tour, Gianna performs as special guest in ‘Rock Meets Classics’ with 19 dates between March and April accompanied by the Bohemian Symphony Orchestra of Prague. On 4th May she starts HITALIA ROCKS TOUR: 10 dates in the most important Italian arenas. On 30th October she releases under Sony Music, HITSTORY. It is a Greatest Hits album which contains 32 tracks in the standard version and 45 tracks in the Deluxe edition, including GIOCAGIANNA that takes up the Third Paradise symbol by Michelangelo Pistoletto. On 5th December Gianna receives the ‘Elsa Morante’ award, a prestigious award given thirty years after the death of Elsa Morante, for being able to re-interpret her lyrics and give new life to her spirit. On 1st December Gianna releases HITALIA, that becomes one of the most sold albums and just a month after the release it becomes Platinum. On 15th January she releases INNO, a new album with all new songs by Gianna Nannini and immediately becomes one of the most sold albums. INNO anticipates the Inno Tour that will start in Rome on 12th April and ends in Germany on 27th July, with performances in the main Italian and European arenas and stadiums. On 15th November Gianna is awarded the Elsa Morante Award, in “Parole in Musica” category. On 7th December she releases LA FINE DEL MONDO, the first single of INNO – her brand new album out on 15th January 2013. The most awaited album IO E TE is out on January 11th, produced by Sony Music. The album is entirely recorded in London at the world famous Abbey Road Studios and it features the London Orchestra. The album is produced by Will Malone. In just a few days the album becomes a best selling album reaching a double platinum. On march 3rd Gianna Nannini attends the opening of an exhibition dedicated to Michelangelo Pistoletto at the Maxxi Museum in Rome: she performs live and creates a vocal installation designed together with Pistoletto himself, named “Terzo Paradiso Mama”. On March 24th Gianna attends the Echo 2011 – German Music Awards in Berlin as a special guest. On April 29th Gianna opened “Io e Te Tour 2011” take place in Milan, Rome, Reggio Calabria, Acireale, Eboli, Caserta, Perugia, Bologna, Verona, Villorba, Bolzano, Florence, Pesaro, Genoa, and Turin. The tour ends with a total of 170.000 tickets sold all around the country. On June 25th she starts the European leg of “Io e Te Tour 2011 – Europa” playing a special show at the Hard Rock Calling Festival, then taking off to play 14 shows in the most important cities in Germany, Switzerland and The Netherlands. On September 2nd, at the Serpentine Gallery in London, Gianna meets the directors of the museum with Michelangelo Pistoletto and performs in the Peter Zumthor pavillion playing her vocal sculpture Terzo Paradiso Mama. On 19th November, Gianna Nannini receives the Pyramide con Marni award during the UNESCO Gala held in Dusseldorf. On June 21st she releases her double DVD of the project “Amiche per l’Abruzzo” which becomes the best-selling DVD in Italy, preceded by the single Donna d’Onna on sale in digital platforms. All income, with those generated by the show the year before, is donated to the Abruzzo populations hit by the earthquake. On May 28th she performs on stage at the Wind Music Awards where she sings Sei nell’Anima, a duet with Giorgia, and receives an award for her album GIANNADREAM. She plays herself in the film “Genitori e Figli” by Giovanni Veronesi performing a track called Maledetto Ciao and a new song entitled Sogno, written specifically for the film, for which she receives a nomination for the Nastro d’Argento award. She releases her new album GIANNADREAM – Solo i sogni sono veri, once again in collaboration with Will Malone, which contains 10 brand new tracks (over 400,000 copies sold). She joins the most famous singers in Italy in recording a track called Domani 21/04/09, where all the income goes to the earthquake victims in Abruzzo. On June 21st she sings on stage in San Siro during the “Amiche per l’Abruzzo” all-female concert, along with Laura Pausini, Fiorella Mannoia, Giorgia and Elisa; she writes a new song for the occasion entitled Donna D’Onna and makes a debut performance during the concert. All the income is donated entirely to reconstruction projects in Aquila. On September 13th she plays a rock symphonic concert at the Arena di Verona with Will Malone’s London Studio Orchestra; three live recordings were made in that night and was included on the album entitled EXTRADREAM. She writes the soundtrack for the film “Viola di mare”, with Valeria Solarino, which also gets nominated for a Nastro d’Argento. She released a single called Salvami featuring Giorgia, and makes a remake of I Maschi with Ornella Vanoni. On December 21st, and for one day only, RAM presents the exhibition by Gianna Nannini and Emilio Prini, “Fotocopiami la voce” at BunKerat, where the theme of Gianna’s Sound Installation dedicated to the voice. She attends the 5th edition of the “Festival Teatro Canzone Giorgio Gaber”. She sings at an event called “O’scià”, organised by Claudio Baglioni in Lampedusa aimed at raising public awareness on the issue of immigration. Bompiani issues a book entitled “Gianna Nannini, Stati d’Anima” a book with texts and photos with Gianna’s thoughts, a story by Edoardo Nesi with visual designer Alberto Bettinetti. The track Colpo di Fulmine written by Gianna Nannini and sung by Lola Ponce and Giò di Tonno wins the Sanremo Festival. In February, “Forma e Suono” project is held at BunKerat in Milan, where RAM radioartemobile presents the works by Getulio Alviani and Gianna Nannini, “Mi meraviglio di te”. She is opening act for Bon Jovi in Germany during their “Lost Highway” tour and receiveds an outstanding reaction from the audience. She joins Fabri Fibra with his single “In Italia”, and sings with Pacifico “Tu che sei parte di me”. She receives a nomination for the Nastro d’Argento award in the “Best Original Song” category for Pazienza (soundtrack of “Riprendimi”). This is the year of PIA, a modern lyrical opera (libretto by Pia Pera) composed by Gianna 12 years earlier. While waiting for the opera to be staged by David Zard, she releases the album PIA COME LA CANTO IO, again with the co-production of Will Malone. The album represents a sort of anthology of the Opera itself, where Gianna’s voice interprets all the characters. These and other texts of the Opera are included in a concert tour throughout Italy; the Arena di Verona concert under the rain became an epic event, in addition to the two nights in Rome which were completely sold out. She participates in the album “Danson Metropoli – Canzoni di Paolo Conte” by Avion Travel, where she sings Elisir with Paolo Conte. The album GIANNABEST is released (and in a few months reach Diamond), a collection of her greatest hits, accompanied by three new songs. The ghost track of the 1st record, Sola con la vela, is the first song written by Gianna when she was teen, and she used to sing it at many auditions and talent shows in the past. She performs in shows in arenas and theatres across Europe, reaching sold out in every show. In London she performs at the famous Shepherd’s Bush Empire. During the tour, Fabri Fibra sings the new version of the final rap in Baccano. The track, Pazienza, was chosen as the soundtrack to the film “Riprendimi” produced by Francesca Neri. In the United Kingdom she releases the single Sei nell’anima in English – entitled Hold the Moon. A work entitled “Superficie in ceramica” by Carla Accardi and Gianna Nannini was presented at the Museum of Contemporary Art in Moscow. The work consists of a porcelain tile floor, with alternating green and cobalt blue decorations on a white background. The music by Gianna Nannini, created to accompany the steps of the public, was recorded in the Red Square in Moscow. In July she sings at the Tune Festival, a music festival in London, in the splendid venue of the Institute of Contemporary Arts, sharing the stage with fantastic artists from all around the world. Meravigliosa Creatura and Aria become the soundtracks for the Fiat Bravo television adverts. The Sound Installation by Michelangelo Pistoletto and Gianna Nannini, “Il Terzo Paradiso” was presented on November 19th at the NCCA (National Centre for Contemporary Arts) in Moscow. The Sound Installation/event sees performances by the Orchestra di Stracci from Pistoletto and the “vocal sculpture” Mamma by Nannini. The album GRAZIE is released, co-produced by Will Malone, reaching the top of the Italian charts, landing Diamond after just 6 months; by the end of the year it is the best-selling album in Italy, winning the “Album of the Year” at Festivalbar. The second single becomes the summer smash hit of the year. She receives the “Ricci d’Argento” award from Fatti di Musica for the best live performance of the year. The track Sei nell’anima becomes the soundtrack of the film by Giovanni Veronesi “Manuale d’Amore 2 – Capitolo Successivi”, the single Grazie also becomes soundtrack for the film “Quale Amore” by Maurizio Sciarra. She sings the song Ama credi e vai with Andrea Bocelli. She also sings O ‘surdato’ nnamurato in “Promenade” by the Solis String Quartet. She publishes her first book with Rizzoli: IO “autoscatto senza rimpianti,” anti-diary written with rock rhythm. This is the year when album PERLE is released, with 12 greatest-hit tracks and a new track called AMANDOTI, an acoustic cover version of the song by Giovanni Lindo Ferretti – CCCP (also used in the movie “La Vita Io Vorrei”). PERLE lands Platinum in Italy and Gold in Switzerland. “Perle Tour” starts in theatres with two pianos, one played by her and the other by Christian Lohr, and the Solis String Quartet (Neapolitan strings quartet). From the meeting between Isabella Santacroce and Gianna, ARIA is born, which blends her melodic Mediterranean rock with a contemporary electronic pop-rock. She receives the Nastro d’Argento award for the soundtrack of “Momo and the conquest of time.” She participates in disguise at the peace-march from Perugia to Assisi in response to the events about 11th September, as per her action in favour of disarmament. She creates a movie soundtrack of Enzo D’Alo, “Momo”, where the first 18 minutes is screened during the International Film Festival in Venice. Syria releases her own version of the song OCCHI FRAGILI. Gianna moves to Catania for a few months where she works with a post-punk trio from Catania and the writer Isabella Santacroce. She inaugurates the new millennium in front of 500,000 fans in Turin. The partnership with the producer Fabrizio Barbacci (Ligabue, Negrita) leads to the release of album CUORE and is the start of a long artistic collaboration with Will Malone (The Verve, Depeche Mode, The Who, Dido, Massive Attack) who manages the strings in the album. The video clip of UN GIORNO DISUMANO is censored for disturbing scenes. She participates in the “Short Opera” project alongside Andrea Bocelli. Her second official anthology was released: BOMBOLONI, landing Platinum in Italy and Gold in Switzerland. Her brother Alessandro also appears in the video for the single carrying the same name as the album. She launched her third album DISPETTO, in collaboration with Dave M. Allen, anticipated by the single Meravigliosa Creatura played by every radios after midnight on January 1st. Gianna’s commitment to civil and humanitarian causes expands further: she performs at the “Concerto di Solidarietà per gli Immigrati” (Solidarity for Immigrants Concert) at Cinecittà on stage with Pino Daniele, Jovanotti and Luca Carboni, and at the “Concerto per il Tibet” in Turin, where she stars alongside Timoria, Nomadi and a choir of 16 Tibetan monks. She starts then her Extravaganza Club Tour, organised using solar energy only. This project marks the start of her collaboration with the Greenpeace activists, and in July of this year she becomes the star of a most unusual episode: at 11:40 am, with a “commando” of activists, Gianna climbs onto a balcony of the Palazzo Farnese in Rome, more precisely the French Embassy, and holds an impromptu concert in protest against the decision to resume nuclear testing in Mururoa. She graduated in Philosophy at the University of Siena top of her class with honors and a her thesis was entitled “Il corpo nella voce – Relazioni corpo-voce in una prospettiva di antropologia musicale”. “The Body in the voice – body-voice relations in the perspective of musical anthropology”. On May 1st she sings in the traditional labour day concert in Piazza San Giovanni in Rome with a debut performance of OTTAVA VITA. She releases her new album X FORZA E X AMORE, a radical folk album with songs inspired by “Cantar Toscano” experience, produced by Dave M. Allen. The final rap section of the single RADIO BACCANO being sung by Jovanotti. In the same year she works with TIMORIA and records a song by the NOMADI – VAGABONDO. She starts a club tour, with the sole exception of the concert in Alessandria in favour of Greenpeace. The success of the triumphant tour in 1990 was documented by a live album and a long live movie called GIANNISSIMA. In the meanwhile, she continues her shows throughout Italy. She takes part in the “Cantar Toscano” project at the University of Siena, where she performs traditional folk songs of her region. The album SCANDALO is released, produced by Dave M. Allen (The Cure) and recorded with a band of musicians from different European countries; once again, Gianna fills stadiums everywhere in Europe. She continues her collaboration and with Piero Pelù puts signed Madonna Welt and Spiriti Amanti, and with Roberto Vecchioni signed Sorridi and Due Ragazze. The album is distributed in Europe, South America, Indonesia, Thailand, Japan and Hong Kong. In the same year she participates in the project organised by Roberto Cacciapaglia “Un Giorno X”, a movie project with “Pomeriggi Musicali” Orchestra; she also participates in Lorenzo Ferrero’s musical “Night” in Munich. Gianna collaborates with Edoardo Bennato on the text of Un’Estate Italiana, with music by Giorgio Moroder; the song was used as the title theme for the Italian 1990 World Cup, all royalties related to the text is donated to Amnesty International Association. The album called MALAFEMMINA is released, co-produced with Alan Moulder (Smashing Pumpkins, Nine Inch Nails). The album is anticipated by the single Hey Bionda, which is used as the Festivalbar song. The album is distributed in Europe, South America, Hong Kong, Japan and South Africa, landing Platinum in Italy and Switzerland. This is the year of the consecration for Gianna: she releases MASCHI E ALTRI, her first greatest-hits album, selling over half million copies in Europe. The album is released after in South America, South Korea, Israel, South Africa and Australia. The single PROFUMO reaches first position in the charts in Greece, but the video is censored because of the Orthodox Easter celebrations. The song I MASCHI debut at the “World Popular Song Festival” in Tokyo. Gianna Nannini is also the star in a Philips advertising for Metalalkaline batteries with the song AVVENTURIERA. On May 1st she takes part in an exclusive show: she sings alongside Sting and Jack Bruce at the Schauspielhaus in Hamburg with a selection of songs by Bertoldt Brecht and Kurt Weill. The show is broadcast by RAI and many other European TV channels. Through amazing international consensus and applauses, the new album, PROFUMO, is released throughout Europe, South America, South Africa, Australia, South Korea and Japan selling over 1,000,000 copies. Her first live album TUTTO LIVE is released with recordings taken from shows in Berlin, Montreux, Siena, Locarno and Dortmund. The album is released in Europe, Australia, South America, USA, Canada and South Korea. She takes part in the charity project “Musica Italia per Etiopia” with the song Volare. The album PUZZLE is released and the song Fotoromanza, whose videoclip is directed by Michelangelo Antonioni, is the song of the Summer and wins the “Festivalbar” Award, “Vota la Voce” awards and a “Telegatto” Gold award. The album goes platinum in Italy and Fotoromanza tops the hit parades in Italy, Switzerland and Austria. Her European tour in spring is enormously successful: in the Summer of the same year she starts her Italian tour. A few concert venues worth a mention: Berlin, Montreux Jazz Festival and Cologne. Gianna is “Titania” in the first movie of Gabriele Salvatores “Sogno di una notte di mezza estate”; she collaborates also in the movie soundtrack with Mauro Pagani. From the meeting with the producer Conny Plank the album LATIN LOVER is born, which involves the collaboration of musicians like Annie Lennox, Jackie Liebezeit and Hannett Humpe. This fifth album is a huge success all over Europe: it reaches Gold in Germany, Austria and Switzerland and Platinum in Italy. In October, she performs on the legendary Rockpalast Essen stage (5 hours Eurovision live coverage) alongside Kid Creole & The Coconuts and Little Stevens. The album is not only distributed in Europe, but also in Israel, Mexico, Paraguay, South Korea, USA and Canada. Vieni Ragazzo and Come un Treno are part of the soundtrack of the movie by Michelangelo Antonioni, “Identificazione di una donna”. After the release of GN, an experimental album produced by Roberto Cacciapaglia, Gianna meets Peter Zumsteg, a manager of vast international experience, and together they found the self-managed independent label Gienne. Their collaboration lasts twenty-three years. They compose the soundtrack for the film “Sconcerto Rock” by Luciano Mannuzzi produced by Bernardo Bertolucci, the track called ORA was used for the movie trailer and a video clip. She releases her new album CALIFORNIA, a rock record with the first single “America” takes her straight up to the top of the charts in Germany and Northern Europe in 1980. The album goes platinum in Italy and gold in Germany, Switzerland and Austria. Her first important collaborations start to develop, such as the one with PFM. She releases her second album, UNA RADURA. She invents her first piano-vocal concerts. She is noticed by the historical label “Ricordi”, with whom she signs her first contract and releases her first album, GIANNA NANNINI, distributed in Italy, Switzerland and Austria. At the age of 19, and after 7 years of conservatory, she leaves her home and goes to live in Milan where she performs in many ‘off’ clubs. She captures the attention of ‘Number One’ label (Claudio Fabi and Mara Maionchi) and she signes up as the female voice of “Flora Fauna Cemento” band, which she writes and record “Stereotipati Noi”, the track which she participated in “Un Disco per L’Estate” event. Gianna Nannini was born in Siena on June 14.